9-axis sensor module for various applications. A 9-axis sensor and a microcomputer (lpc1343) are implemented on this board, and is enabling the acquisition of sensor data and processing of data on a single board. 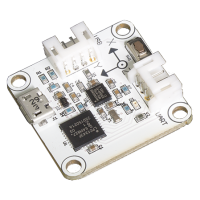 This sensor module is designed for use in the development phase of products such as robots, Malticopta, Game/amusement, motion sensors, portable navigation, RC models, model helicopters, head mount displays, and so on. The sample program is already written in the microcomputer, the sensor value can be acquired immediately only by connecting to USB or UART. Supports ROS (Robot Operating System) and a package for ROS available. You can set the range and the filter on the board side by rewriting the microcomputer’s program by yourself. When connected to a PC using a microUSB cable, the module is recognized as a virtual COM port. The module can be used in exactly the same way as regular serial port from the application. The output data is 3-axis acceleration, 3-Axis geomagnetic field, 3-axis gyro sensor, and temperature. The data refresh cycle is 100hz.